Turkish ground troops have crossed into northern Syria as part of a major offensive to push out Kurdish militia, which Turkey regards as terrorists. The Kurdish group targeted, known as the YPG, is active in the Afrin region, across from Turkey's southern border. It says it has repelled Turkish troops in the area, and retaliated with rocket fire on Turkish border areas. The militia forms a crucial part of a US-backed alliance battling Islamic State (IS) jihadists in Syria. 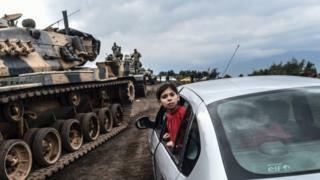 Turkish President Recep Tayyip Erdogan has vowed to crush the YPG "very quickly", but the US is urging Turkish "restraint" in order to avoid civilian casualties. Turkey believes the group has links to the Kurdistan Workers Party (PKK), a banned militant group. The Turkish government has for several months been threatening to clear Kurdish fighters from Afrin and another city, Manbij, some 100km (60 miles) away. What is happening in Afrin? The military operation launched on Saturday, "Olive Branch", is aimed at moving Kurdish forces from Afrin . Plans for the operation were believed to have accelerated when the US announced earlier this month that it would help an anti-IS alliance, formed of these Kurds and ethnic Arab militias, to build a new "border security force" to prevent the return of the jihadists. The YPG and the alliance, called the Syrian Democratic Forces, deny any terrorist links - a claim backed by the US government. 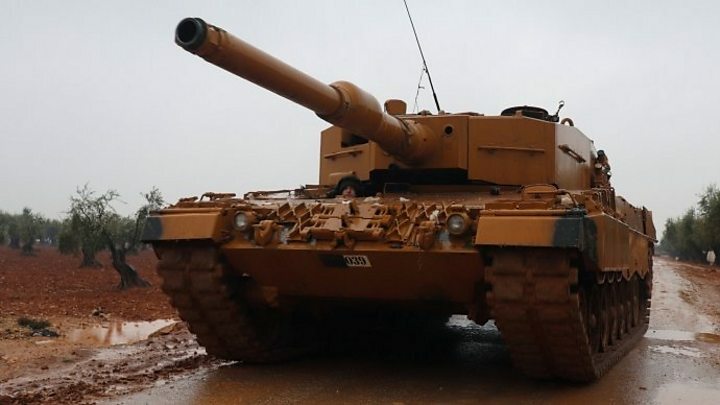 On Sunday, Turkish troops accompanied by pro-Turkey rebels from the Free Syrian Army (FSA), began their advance into Syrian territory following dozens of air strikes the previous day. Turkish Prime Minister Binali Yildirim said the aim was to establish a 30km (19-mile) "safe zone" deep inside Syria. But a spokesperson for the YPG, Nouri Mahmoudi, said the Turkish troops had been "forced to retreat". Some 25,000 FSA fighters have joined the offensive on the Turkish side, rebel commander Maj Yasser Abdul Rahim told Reuters. It is not clear how many Turkish soldiers are on the ground. Turkey's military said it had hit 45 targets on Sunday, as part of its air and ground campaign. It earlier said dozens of air strikes had taken out 153 targets belonging to Kurdish militants. President Erdogan vowed on Sunday to crush the Kurdish fighters in Syria, as well as the PKK. "Our jets took off and started bombing. And now, the ground operation is under way. Now we see how the YPG... are fleeing in Afrin," he said. He also warned that anyone joining pro-Kurdish protests in Turkey over the operation would pay a "heavy price". Police later dispersed demonstrators in a number of Turkish cities, including Istanbul, and made several arrests. Have there been any casualties? There are reports of fatalities on both sides. The YPG said at least four Turkish soldiers and 10 Syrian rebel fighters supporting them were killed in clashes on Sunday morning, but there has been no confirmation from Turkey. The UK-based Syrian Observatory for Human Rights said Turkish air strikes had killed 11 civilians on Sunday. This follows at least nine deaths in strikes on Saturday - six civilians and three fighters - though Ankara said they were all Kurdish militants. Kurdish rockets also hit the Turkish border towns of Kilis and Reyhanli at the weekend, with casualties reported. Turkey's military has been shelling the Afrin region since Thursday, a move which it said was in response to fire coming from the area. How have key players reacted? Western powers, including the US and France, are urging restraint, and the UN Security Council is due to hold an emergency debate on Monday. "They warned us before they launched the aircraft they were going to do it, in consultation with us. And we are working now on the way ahead," US Defence Secretary Jim Mattis told reporters on Sunday. "We'll work this out," he added. Syrian President Bashar al-Assad condemned the incursion, saying: "The brutal Turkish aggression" on Afrin was part of Ankara's policy of "support for terrorism" in Syria. Russia - a key ally of President Assad - also said it was concerned by the news, and withdrew some of its troops based in the area. Moscow will demand Turkey halt its military operations at the UN meeting, according to Russian senator Frants Klintsevich, who is the deputy chairman of the defence and security committee. Iran, another Syria ally, called for a quick end to the operation "to prevent a deepening of the crisis" in Syria. Video Why is Turkey attacking Syria?